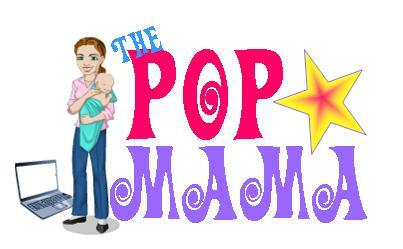 Pop Mama: Who Needs Sleep? Hi! Wow, it has been a crazy couple of weeks. My children have teamed up against me to ensure that I never sleep again. I was so lucky for the first few months of Henry's life and now the sweet spot of Henry's sleepiness is over. As he turned four months old (see pic below) a switch went off and he decided that he was no longer content sleeping through the night and going down without a struggle. He now fusses and struggles and wakes up a few times a night to eat. I'm chalking it up to a growth spurt and praying that it will end soon. On the nights that Henry does sleep, Cam inevitably gets up crying about some issue or another (which we can never figure out). Last weekend as Henry slept peacefully Cameron was up and down all night. My poor husband took the hit that night although I was up a few times to help out. As much as I just complained about Henry's sleep regression, I would rather deal with a 4 month old at 3am than a toddler any day! My new mantra for raising Cameron as he turns 2 next week (!) is "We don't negotiate with terrorists." Just like a terrorist, my toddler is unpredictable, irrational and generally difficult to deal with -- there is no such thing as a "win" -- just mere survival! That being said, my Cammy is also a loving, silly, and smart little boy with a huge personality which makes laugh most of the time. For instance, today at Target we were looking for the milk and he was saying "Milk? Where are you? Milk?" He had me cracking up...until he started screaming in a high pitched voice and thinking it was FUNNY when I told him to stop. Let's just say he is testing his boundaries. There has been a lot going on in pop culture recently and sadly, I have fallen off the grid. I have been keeping up with my idol, Bethenny and have been watching the new season of Game of Thrones (amazing), but that is pretty much it. When you go to bed by 9:30pm, there is only so much time to devote to Bravo and E!. However, I was thrilled to hear yesterday (or Monday, I can't even remember), that Giuliana and Bill Rancic are expecting via gestational surrogate. After all that she has been through in the last few years with a miscarriage, infertility, breast cancer and a double mastectomy, she deserves this fabulous news!!! Congratulations to the couple!